Do you know how much each of your restaurant employees is capable of bringing in? A whopping $84,000 in revenue! How can you create an environment for your staff to succeed... and stay to keep earning that revenue? On average, the cost of hiring and training an hourly employee (such as a restaurant employee) is about $3,500. For your industry, that's an investment that walks out the door nearly 50% of the time. We are at a crossroads here. One in ten people work in the restaurant industry, but with a turnover rate of 72% last year, your employees are leaving for a new job faster than any other sector of the U.S. job market. So, is it worth your time and money to train them? The long answer... It's going to take some work. 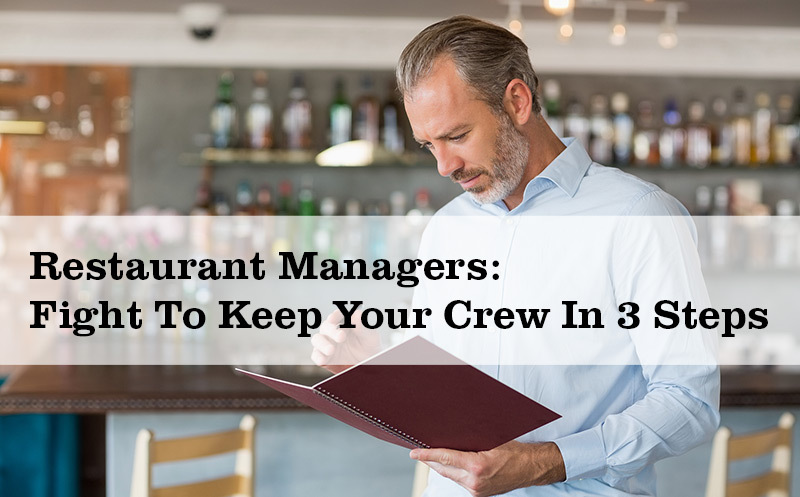 Hiring the best crew and keeping them too is one of the hardest parts of being a restaurant manager. Here are some ways to keep your employees happy while nurturing their careers. Yes, similar to an exit interview - except your staff isn't going anywhere. These are check-ins with your veteran staff that allow you to get a pulse on why they're happy with their job and why they remain an employee. This gives you the chance to learn what you can do to "sweeten the deal" and keep them even longer. 2. Learn what you can do to better their career. If you've hired the right people, then a common trait they'll have is ambition. And they'll look to you for guidance on their next steps (even if they know this isn't a full time gig for them). First, figure out how long your typical employee sticks around, say it's two years. Cut that time in half. This is when you should start creating a track (with their help of course) to get them to the next level at your restaurant. If they want to bartend, let them shadow your star bartender a couple slow nights a week. Talk to your staff once a week about their pain points and ask them how you can help. The more informed you are, the better you can keep the ship afloat, regardless of rocky waters. This year was the first time that consumer spending at restaurants was higher than in grocery stores. Your food might be good, but your staff is going to keep those loyal regulars coming back. Put the time in today to keep the best in your kitchen, and not in someone else's. This blog is a guest feature from Hannah Harrington at Upserve - the only restaurant intelligence platform that connects guests, menu, and staff in single place, providing real-time guidance that empowers restaurants to unlock their full potential. Learn more about Upserve today.